This is just a quick post about the first of several fun little onesies I’m embellishing for my new nephew, because guess what? Even though we’re not even unpacked and barely settled, there’s something speggtacular going down at the new Mall residence. You may cry fowl, but the boys are eggstatic and I barely have time to peck this out before going back to work. 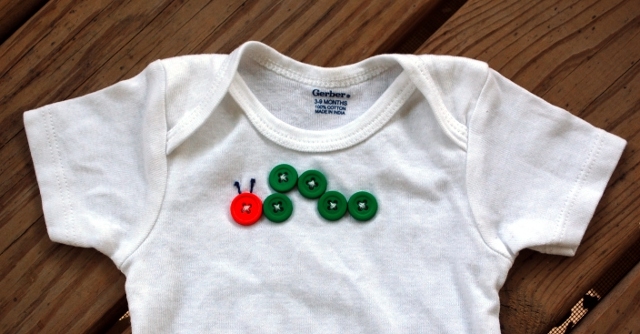 I found the idea for a button caterpillar on Pinterest, of course, but because he’s a manly little boy I elected not to use rainbow-colored buttons. Instead, I took my color scheme loosely from The Very Hungry Caterpillar, and I love how it turned out. I hope you like it, and who knows – maybe I can scratch up enough time to do another one today! This entry was posted in How To, Make it in Minutes. Ok, that is extremely cool! I love it!! !